From his small island of Cuba, the late Cuban leader Fidel Castro faced down the United States and made them blink. “The world marks the passing of a brutal dictator who oppressed his own people for nearly six decades,” said Donald Trump in a statement. Not only does Avlon try to drive a silver stake through Castro's black heart, he despises and demonizes anyone ever naïve enough to think Castro was anything but a selfish tyrannical dictator. It's the idiom of Trumpian bombast, not reasoned discourse. Avlon condemns Castro's politics and methods but ignores the Cuban strongman’s tactical genius, immense courage, and his decades-long political balancing act -- as well as the many advances Cuba was able to make in health care and education, even in the face of a cruel and stupid U.S. blockade that began decades ago and continues today. That blockade imposed hardship and suffering on the Cuban people, but never threatened the Castro regime. Castro's example electrified Latin America. From his small island he had faced down the almighty gringos and made them blink first. That was his greatest threat to the United States. 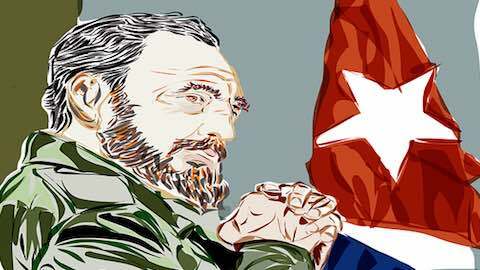 Castro inspired many people in various countries living under U.S.-supported despotic regimes -- who until then considered their situations inevitable and intractable -- to rise up against inequality and injustice. Fidel was the godfather of Latin America's leftist turn: in Nicaragua, Honduras, Venezuela, Bolivia, Ecuador, Argentina, and Brazil. The populist spirit has always been embattled in Latin America. Fidel proved it could triumph. He survived the regimes of 10 U.S, presidents, each of whom figured to crush him and none of whom could. Fidel Castro was the Road Runner to the USA's Wile E. Coyote. He withstood decades of intrigue against him by the United States, including assassination attempts, a naval blockade and military invasion. He played the Cold War superpowers off against each other in a high-stakes gamble for his nation's survival. Trump and Avlon's defamatory anger bespeaks their frustration with a smarter, braver political opponent. Millions around the world loved the show. Latin America: "Castro: No Saint, But Was a Giant"